In just a few months, Dedicated Athlete owner John Gamble has taken his natural blood builder "EP-NO" from a few local bicycle shops in the Atlanta area to international sales and positive endorsements from professional endurance athletes and teams across the country. The company celebrates its one-year anniversary this month for the successful launch of EP-NO. Gamble, a biochemist and cycling coach, spent five years developing a natural nutrition product with superior ingredient that would provide endurance athletes exceptional absorbability and safe performance benefits. In September, the EP-NO product received an endorsement from Jonathan Vaughters as a staple training tool for Team Slipstream p/b Chipotle Professional Cycling Team. "2006 was the first season where we did a full schedule in Europe. A schedule of that intensity grinds on everybody. Obviously we've seen, in the past, guys start to flirt with anemia, and definitely red cell counts and iron counts lower. The greatest thing about EP-NO is that it's an organic iron and not just a chemical extraction iron. It absorbs so much better into the body," said Vaughters, an acclaimed climber as a professional and winner of Stage 5 in the 2001 Tour de France, who is currently the Directeur Sportif/general manager of Team Slipstream presented by Chipotle. Team Slipstream is one of several professional teams using EP-NO. "We have adopted a strong anti-doping message on our team and therefore we're giving top level athletes an alternative. (With EP-NO) we're giving them the ability to keep the red blood cells high and to keep their iron count high. It makes a whole lot more sense," Vaughters added. EP-NO is also being used by other top road cycling teams in the U.S., including Jittery Joe's Professional Cycling and Jelly Belly Pro Cycling. Gamble is sponsoring a developmental team in 2007, based in Winston-Salem, N.C., named TIME/Dedicated Athlete/Cyclesafe.org. Future plans are for Dedicated Athlete to market its products to other types of endurance sports, such as distance running and cross-country skiing. 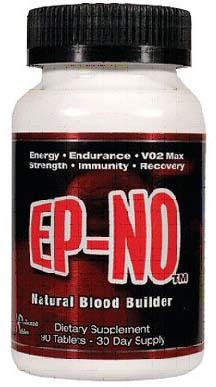 The name of the product, EP-NO, was specifically designed to send a clear message to athletes. It makes reference to the hormone erythropoietin (EPO) that has been used illicitly for boosting the number of red blood cells in a person's body to enhance athletic performance. While healthy blood helps an athlete improve aerobic capacity and stamina, Gamble knows healthy blood is important to protect the body from illness and injury as well. "The name of my product sends a message without pointing fingers. It was developed to be taken daily to maintain healthy blood levels. I believe the foundation of health and performance starts with the blood, which carries all the vital nutrients we need for energy, power, immunity, recovery and of course endurance," said Gamble, who has a B.S. in Biology (biochemistry/physiology) from Life University. "And I want to give elite athletes a viable, safe option to deter them from even considering doping." The role of nutritional supplements often makes it a challenge to distinguish between advanced training and illegal cheating. EP-NO has proven to be more than a catchy name, but a reliable, natural nutrition product for endurance athletes, as well as women who are iron deficient. Endurance athletes such as cyclists, triathletes and marathon runners do require more iron than the average person. They experience accelerated red blood cell damage, injuries to muscle, loss of iron through sweat, and insufficient time to reabsorb iron. Key ingredients come from natural sources of liver and beet root synergistically mixed with vitamins and minerals. The liver and beet root help make the blood more alkaline and help increase metabolism of natural enzymes. In particular, this allows heme and non-heme iron sources to be absorbed safer, faster and easier, making EP-NO more effective. "I have gone from selling 302 bottles of EP-NO in our first month to over 1600 bottles in one month. That surpasses our expectations on sales for our first two years," Gamble added about the surge in requests for the new product. "Athletes are asking for the product by name. So I'm very happy with the early success and the feedback has been phenomenal." At the close of 2006, EP-NO was the supplement of choice for a majority of professional cyclists in the United States, accounting for 512 podium finishes. Gamble plans to expand his marketing program in 2007 to target a broader base of consumers and recreational athletes, blending consumer advertising with event promotions. He plans to have an expo exhibit at cycling events like the Tour de Georgia. Gamble will produce two versions of EP-NO in 2007, with varying amounts of iron for specific target markets. His company Dedicated Athlete also sells a multivitamin and will introduce a premium recovery sports drink in April, Rapid Recharge. Dedicated Athlete products are sold at health food stores, select bicycle and multi-sport shops and a variety of online and catalog merchandisers, such as A1supplements.com, performancebike.com, worldcycling.com and nashbar.com. For more information on this revolutionary product developed in Georgia, visit the web site, www.dedicatedathlete.com. EP-NO is designed to help increase your hemoglobin and red blood cell count with absorbable iron from natural sources of liver and beets. Liver has a full amino acid profile and natural beet root has clinically shown strong antioxidant properties for the blood. EP-NO also provides the building block for the blood with vitamins B6, B12, C and Folic Acid. EP-NO contains 70% natural ingredients. EP-NO contains strong antioxidants that scavenge free radicals. EP-NO is non-toxic and easy to digest. It uses clinically researched ingredients that help improve blood. One bottle of EP-NO contains 90 tablets, a 30-day supply for suggested retail of $24.99. wo versions will be available in 2007- one with 30mg of iron and one with 3mg of iron. Dedicated Athlete also makes Athletes' Multivitamin and will introduce Rapid Recharge (recovery drink) in Spring 2007. Dedicated Athlete is based in Woodstock, Georgia and is operated by founder/CEO John Gamble. John Gamble is a trained biochemist who also used to compete at the elite level in road cycling. Gamble coached the Fort Lewis College (Durango, CO) men's cycling team to a second place overall finish at the collegiate road nationals in 2003, under team director Rick Crawford. Gamble continues to coach a select number of elite cyclists in Georgia. Dedicated Athlete currently sponsors some of the top road cycling teams in the U.S., including Jittery Joe's Professional Cycling, Team Slipstream presented by Chipotle, Jelly Belly Pro Cycling, GIANT MTB, and the TIME/Dedicated Athlete/Cyclesafe.org developmental team based in Winston-Salem, N.C.